Accurate Valiant BV400 Multiplier Reel. Valiant is the new generation of reels focusing on Small Reels Big Fish built exclusively for braid. This series of reels were designed with Precise, Powerful Performance in mind. These reels are proven globally in a very limited amount of time. 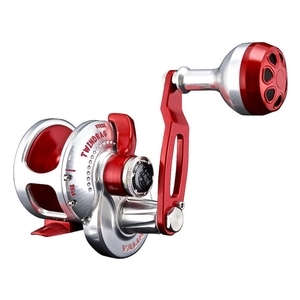 The Valiant series of reels with their unique shape design, focus on more curvature lines that create strength but also reduce weight of the reels. This gives you reels that are comfortable to fish with all day while being able to put out at least 20 lbs of drag with even the smallest size. Built with the best materials including 6061 T6 aircraft aluminum, 17-4 stainless steel gears plus shaft, with a new stainless steel ARB Bearing, these reels are made to put out some power. If its Pelagic game fish or fishing coastally for your favorite quarry, the Valiant coupled with todays lightweight graphite composite rods gives anglers a lightweight, powerful combo for hours of fishing pleasure.